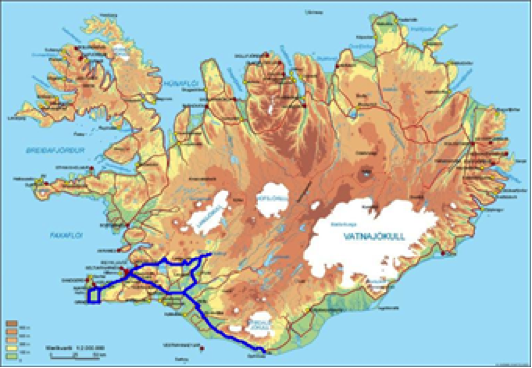 We will explore Southwest Iceland, known for its natural wonders and cultural sights. See glittering glaciers, snow-clad mountains, giant lava fields, steaming hot springs and beautiful waterfalls. Bathe in the mineral rich geothermal waters of the Blue Lagoon, walk on a black lava beach, visit Icelandic horses on their farm, photography idyllic turf houses and travel close to the famous Eyjafjallajökull volcano. This short getaway to Iceland offers insight into Iceland's nature and cultural life, with two nights in Iceland's capital and two nights in South Iceland, an ideal location for the search for the Northern Lights. Also called Aurora Borealis, they are visible in the northern sky from September through April when the sky is clear and free of clouds. During this tour it is possible to book an optional glacier hike. At 09:00 meet your tour guide who shows the group the highlights of Iceland's exciting capital. Then head out to the Reykjanes Peninsula with its hot springs, mountains, bird cliffs, light houses and fishing villages. At the end of the day, we get to soak off our travels in the warm mineral waters of the famous Blue Lagoon. 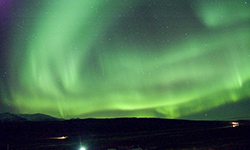 In the evening, we hear about the Northern Lights from our tour guide at Árhús Cottages. Naturally, once darkness falls, you are out in the garden waiting for the Northern Lights. Today we head along the south coast and reach the area near the active volcano that is beneath the Eyjafjallajökull glacier. We stop at the high but narrow Seljalandsfoss waterfall, which plunges from the mountain. Next we visit Skógar folk museums, which contains an outstanding collection of farm and domestic artifacts from Iceland's past and several turf-built houses. Nearby is one of the most impressive waterfalls in the country; the 60 meter high Skógafoss waterfall. In the afternoon we offer an optional glacier walk. The Sólheimajökull glacier tongue extends from the great Mýrdalsjökull glacier, down to the sandy plains of the Icelandic south coast. The spectacular surroundings are marked by rugged and majestic rock formations thoroughly shaped by the glacier. On this fun, safe and easy to moderate glacier walk you get to explore the wonderland of ice sculptures, water cauldrons, ridges and deep crevasses on the breath-taking Sólheimajökull glacier. While enjoying all the features of the glacier and its spectacular surroundings, you will learn more about the behavior of glaciers and their impact on nature. No technical requirements are needed for the tour as an experienced glacier guide will teach you how to use basic glacier equipment, such as crampons and an ice axe which are provided for glacier walk tours. The unique experience of a glacier walk on one of the many retreating glaciers of the world is sure to leave lasting memories. Duration of this activity is about 3 hours in total, about 90 minutes on the ice and about 30-40 min walk (one-way) from the parking lot to the glacier edge itself. Minimum age for the glacier hike is 10 years. You need to bring warm clothing, rain gear and hiking boots. The glacier hike can only be booked with the guide on day 2. The special price for the Land of Northern Lights group members is ISK 12.000 (about EUR 100 per person) instead of ISK 14.900 official rate. Payment is due in with the glacier hike company on day 3 Icelandic Krona - cash only! If you booked the trip without the glacier hike, then the tour continues further south where you can stroll on the black lava beach to see the amazing bird cliffs at Reynisfjara near Vík. In the evening there is another presentation about the Northern Lights. If the night is clear, you might see the Northern Lights swirling in a wild and carefree dance across the heavens in dramatic shapes, colours, patterns and sizes. The grounds of Árhús Cottages and the Stracta Hotel in Hella are very large and dark and offer you a good location for Northern Lights search if the weather conditions are right. It requires patience, warm clothing and the excitement of "maybe there could be Northern Lights". INFORMATION REGARDING DINNERS: In Reykjavik, the dinner is on your own. There are many restaurants for both fast food and a fine a la carte dining in Iceland's capital. The Árhús Cottages and Stracta Hotel in South Iceland offer a limited a la carte menu with a selection of fish, meat and vegetarian as main course. Lunch stops are made at small country restaurants or petrol station diners.